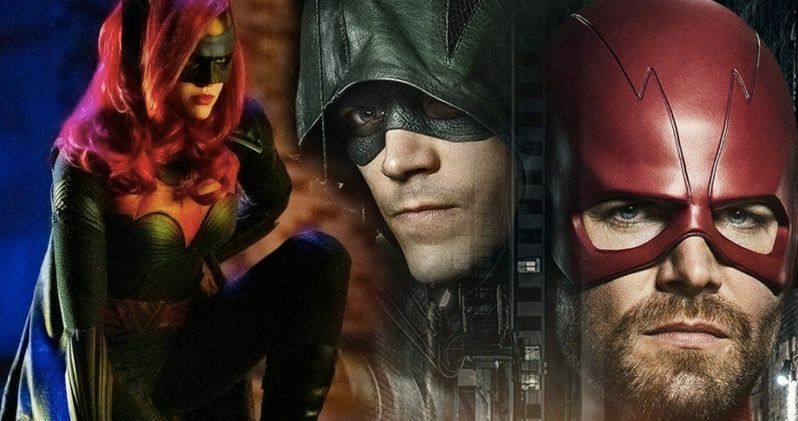 We finally have a full synopsis for the upcoming Arrowverse crossover event, Elseworlds. Ever since this year's annual crossover was announced, it was clear that this was going to be anything but business as usual. This event is going to shake things up in a major way for the small screen DC heroes over on The CW. While much of what's in store remains under wraps, these new story details help us understand how the events are going to unfold. The event kicks off with The Flash on Sunday, December 9 in Elseworlds Part 1, which is described as follows. When Barry Allen (Grant Gustin) and Oliver Queen (guest star Stephen Amell) wake up one morning and realize they have swapped bodies with each other, the two set off to find out what disturbed the timeline to cause such a shift. However, things quickly go from bad to worse when they present their case to Team Flash and the gang doesn't believe them. Barry and Oliver realize they need Supergirl's (guest star Melissa Benoist) help and travel to Smallville on Earth-38 where they end up meeting Kara's cousin, Clark Kent (guest star Tyler Hoechlin), and intrepid reporter, Lois Lane (guest star Elizabeth Tulloch). LaMonica Garrett guest stars as The Monitor. Kevin Tancharoen directed the episode written by Eric Wallace & Sam Chalsen (#509). We've seen these life-swapping shenanigans at play already in a few various promos and it sounds like Barry and Oliver are going to be just as confused as we are when things get started. One of the biggest draws of this year's event is the introduction of Ruby Rose as Batwoman, who will officially bring Gotham City into the Arrowverse. She'll arrive on Monday, December 10 on Arrow in Elseworlds Part 2. Here's the official synopsis for that episode. "With Oliver (Stephen Amell) and Barry (guest star Grant Gustin) still stuck in the other's bodies, the two get a lead on John Deegan (guest star Jeremy Davies) and head to Gotham City with Supergirl (guest star Melissa Benoist) to figure out why their reality has changed. While there, they meet the mysterious Kate Kane (guest star Ruby Rose) who provides them with information that leads the group to Arkham Asylum. James Bamford directed the episode with teleplay by Marc Guggenheim and story by Caroline Dries (#709)." The idea is that this will be used as a launching pad for a Batwoman TV series, which would likely debut in fall 2019. Moving on, as we've seen in previous promos, Superman is going to be featured in his iconic black suit, which first appears in DC Comics following his resurrection, which means he has to die first. It sounds like we'll see that come to fruition during the event's conclusion, which happens on Tuesday, December 11 on Supergirl in Elseworlds Part 3}. Though a bit more vague, here's the synopsis for the event's finale. "Supergirl (Melissa Benoist), The Flash (guest star Grant Gustin), Green Arrow (guest star Stephen Amell) and Superman (guest star Tyler Hoechlin) engage in the battle of their lives. Jesse Warn directed the episode with story by Marc Guggenheim and teleplay by Derek Simon & Robert Rovner (#409)." It's also worth mentioning that John Wesley Shipp will be suiting back up in all of his 90s Flash glory for Elseworlds. As for the Legends of Tomorrow, they are sitting this one out, but it sounds like there's more than enough going on to fill up these three nights. The CW may very well have outdone themselves this time.